Escaping the crowds in Angkor Wat can be difficult, if not downright impossible. I managed to evade the tour buses fairly well by arriving right at opening time. After a couple of hours, they’d catch up to me, of course. They’d swarm into tiny temples in groups of 30 or more, but I managed to enjoy the first few hours of cooler temps and better light undisturbed. Unfortunately, this strategy didn’t work for very well for sunset, when the park was already flooded with other tourists. Tip: you can find more information on Angkor Wat and other temples at the Archaeological Park on Overseas Attractions. They’ve thoroughly covered all the temples in Siem Reap and have simple guides to each one so you know which temples are worth visiting. On my first evening in the park, my tuk tuk driver dropped me off at the trailhead to Phnom Bakheng, the most popular sunset spot in the park. After a 15 minute hike up a hill, I turned the corner to find a steep, well-preserved stone temple. Along its upper level, well over 500 tourists swarmed about, packed cheek to jowl. I’ve never felt claustrophobic outdoors, but now I know it’s possible. Tiny Beng Thom Temple sits at the southwest corner of Angkor Thom. Visually, it’s nothing too spectacular — especially when compared to the other amazing ruins in the park. But what it does offer is something that none of those can: peace, quiet, and solitude. I can’t claim to have discovered this spot — my friend Jodi told me about it and I’m sure she learned it from someone else. 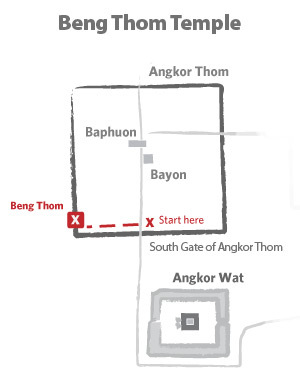 It’s very easy to find: simply have your driver drop you at the South Gate of Angkor Thom. From there you walk along the top of the wall for about 20 minutes — to your left is the massive moat about 20 feet below and to your right is forest, filled with birds, hooting monkeys, and rustling critters I never did quite see. When you arrive at the corner, you’ll be rewarded with a spectacular view to the west, with the moat on two sides and this short, gray stone temple all to yourself. You’ll also realize that you’ve just walked 20 minutes and only covered half of a side of Angkor Thom — it really drives home just how large this place is. In the end, I made the trip and had a lovely time but the sunset evaded me. Thick clouds on the horizon drowned out the sun long before it began to change color. Maybe your luck will be better. Frack! So glad the site was saved. You freaked me out. I was lucky with sunset viewing at Angkor. Had a clear view, but the crowd behaviour was surreal. It felt like I was attending a rock concert devoted to the sun – hoards of sweaty, dehydrated people who would normally be moshing or crowd surfing were actually silent, even grave. The sun should do those more often, probably make a killing touring in Japan. Love the map, cute! .-= Nomadic Chick´s last blog ..Second Day of Layoff =-. Thanks Jeannie! The site blowup was a bummer. Still haven’t figured out what caused it but have it about 80% of normal now. Need to do some fine-tuning but that will have to wait until I have time and bandwidth. Good tip. We were at Angkor Wat in 2003, I can’t imagine how crowded it must be now. We thought it was bad then, but I have heard that it has become out of control. I’m glad that you found a place that has still a little bit of solitude. It’s pretty crazy, and I was there during the ‘shoulder season’. The tuk tuk drivers were lamenting the low numbers of tourists, but it seemed pretty crowded to me. Did you know that if you go a little further there are more impressive and bigger temples almost completely empty! One of them is Beng melea, Koh Ker, etc! Beng Melea was the best temple for us! Very large and impressive! ^^ To Wes.. Trust me!! Beng Melea is freaking worth it! It’s huge and massive! No tourist and you get to climb everywhere and it’s better than Ta Prhom! If you want to see Mayan Like Pyramid go to Koh ker! This site is completely different than what you see at Angkor! What’s so special about Angkor Wat? nice , would like to go to Tiny Beng Thom Temple someday…. Angkor Wat is high on my list, now I’m not sure as I find it hard to enjoy the sights when there are literally crowds of people. Maybe Cambodia, but I’ll read that post as well first. Yeah, there are tons of bus tours in Angkor Wat. Best bet is to go right at opening time. Really nice pic, it looks amazing, hope I can go in the future.